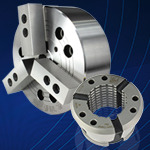 At Lyndex-Nikken, we produce the tools to meet your manufacturing needs. Our expertise extends to every industry. From automotive engineering to construction, we serve every industry with solutions and provide the tools that allow the manufacture of the highest quality and safest products in your life. As a solution provider, we supply customers with engineered solutions that help them reduce machine cycle times and setups, improving consistency and quality, while increasing payback on your investment.